This year we partnered with Shaw Communications and Vancity Credit Union to bring Mobi by Shaw Go to the youth at Pathways to Education. By providing Pathways youth with free bike share memberships for the year, we hope to open them to the world of active transportation, provide them a sense of independence, and better connect them to their community. We asked Vanessa, the Academic Facilitator at Pathways to Education in Vancouver, a few questions about the organization and the impact this partnership has had on the youth in their program. Thanks for answering our questions Vanessa! Mobi: Can you tell us about Pathways Vancouver? Vanessa: While Pathways to Education has been around since 2001, Pathways Vancouver is still a young program. We are currently in our fifth year, and our first cohort of Grade 12s will be graduating this June. It’s very exciting! Pathways Vancouver operates in one of the most marginalized postal codes in Canada and, working together with other local agencies and services, we support youth in the neighbourhood. Pathways aims to reduce the barriers to education that young people in the community face and raise the high school graduation rates of the neighbourhoods we serve. In addition to academic support—such as an accessible, free tutoring program—Pathways offers one-on-one youth worker support, social supports—such as mentoring opportunities—and financial supports. Participants have access to grocery cards, bus passes, and scholarships for post-secondary pursuits. We are a youth-centered program and see the value, talent, and skills students in our program bring to their community. Mobi: How long have you worked with Pathways to Education and what does your role entail? Vanessa: I’m the Academic Facilitator at Pathways to Education in Vancouver and have worked there for two years. I oversee the tutoring program, which is a part of the academic supports that the Pathways to Education Program provides. I’m the person youth see when they arrive—greeting them, checking in on how they’re doing, finding out what homework and tests they have, and if they need support from our volunteer tutors. A big part of my job is just making sure the students feel welcome and safe, and also by supporting them to be more engaged and motivated about their learning. I connect youth with resources and build relationships, so they can feel more empowered to access what they need to succeed. Mobi: How long have you lived in Vancouver? Vanessa: Most of my life. I moved to Vancouver when I was six years old, so it’s been just over 30 years! Mobi: How did you first hear about Mobi by Shaw Go? Mobi: What was it like when the students first heard about the partnership? What was their reaction? Vanessa: Many of the students were excited right off the bat. They were eager to join and signed up right away. Other youths were unsure of what the program entailed and didn’t sign up until they saw all their neighbourhood friends using the bikes and having fun riding around. What are some of the barriers that Pathways students face and has Mobi by Shaw Go helped students overcome any of these barriers? Vanessa: Many of the youth come from families who face financial barriers and access issues. Most of the youth in our program do not own their own bikes. Those who do own bikes do not like to leave their bikes locked up outside as they live in a high bike theft area. What does an average day in the life of Pathways students look like? Vanessa: Just like any other students, they attend school, participate in school team sports, participate in numerous clubs and activities, and of course, they make time in their day to meet with Pathways staff, or attend our mentoring or tutoring programs in the evenings. The youth in our program are very involved in their community—most have multiple extra-curricular activities, work, or volunteer obligations and they still make time to come in and get help from tutors in the evening! Mobi: Before Mobi by Shaw Go, what role did bikes play for Pathways students? Vanessa: Only some youth used their bikes to get around the neighbourhood. The ease of Mobi bikes and convenient locations make it very accessible and easy to engage with for students. They have been riding much more frequently. Mobi: What are some of the ways that Pathways students utilize the bikes and what for? Vanessa: They use them to get to and from school. As the weather gets better, the youth will be using them to explore beyond the neighbourhood a lot more. Many have already expressed that they are excited to use the bikes to explore Vancouver’s famous seawall. Mobi: What do the bikes mean for the students future? How has it impacted their lives? Vanessa: It’s definitely improving the fitness levels of all the youth who have to ride uphill to school! I can definitely say that the youth I know who are making use of the bike share program are feeling really good about it and enjoy riding the bikes around the neighbourhood. They are forming healthy habits. Mobi: What are the larger implications of the bikes? Has this had an impact on their sense of self and or self-confidence? Vanessa: It has given them a sense of responsibility over community items and also an introduction to the ‘share economy’. Tackling a new challenge like borrowing a bike from the docking stations, using their own fobs and passwords, and also reaching out and following up with Mobi by Shaw Go staff if there are any issues has really helped them become more confident and independent. It also fosters a sense of community outside of their regular interactions. Mobi: Where are some of the places that students most often ride to? Vanessa: They use them to commute to school and to work, and also for little adventures in the neighbourhood. It’s been a cold winter season, but as soon as it warms up, they will be riding out farther and enjoying more of our bike-friendly city. 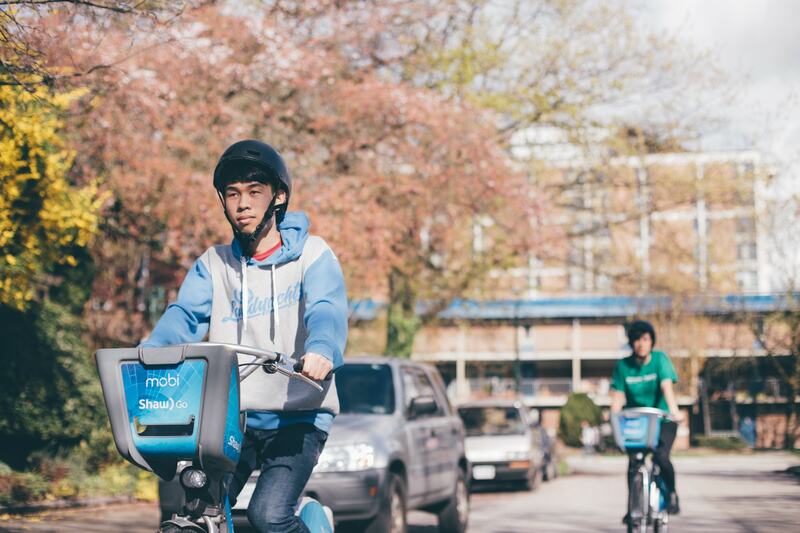 Mobi: How has their experience of Vancouver been altered? Vanessa: The city is more accessible to them. The bikes and docking locations give them a chance to venture out of the neighbourhood and explore more areas in the city. Mobi: Why are partnerships like this one, between Mobi by Shaw Go and Pathways important? Vanessa: Partnerships enable us to offer more to youth in our program, enriching their experiences and access to resources. Mobi: Do you have any fun stories, special moments, or anything else to share? Vanessa: Our youth workers have witnessed the “afterschool rush”. As soon as school ends, there is a rush of Pathways youth running from school to the Mobi bike station that is located in a parking lot behind their school. The experience has definitely brought some more fun and excitement to their everyday routine!